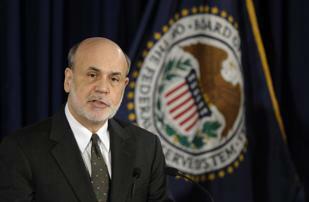 Ben Bernanke might want to take it all back. The Federal Reserve chairman has rattled investors recently by suggesting the Fed could curtail its easy-money policies later this year as the economy gets stronger. Problem is, the economy isn’t getting stronger. Not yet, anyway. In fact, it’s weaker than we thought. Economic growth in the first quarter, it turns out, was just 1.8%. The government’s earlier estimate was 2.4% growth. Revisions in economic data are common, but that’s a large and surprising drop. And it comes at a particularly sensitive time for financial markets, when changes in the real economy are likely to directly influence Fed policies that determine the direction of stock and bond prices. The new GDP estimate for the first quarter reflects lower consumer spending on services such as travel and healthcare than previously thought. One thing pushing up growth was spending on utilities, which was driven by cold weather and isn’t a sign of an improving economy. A buildup of inventories was another discouraging factor; this means goods are sitting on shelves instead of heading out the door. “These final GDP growth figures spotlight the underlying and ongoing weakness in the consumer sector,” forecasting firm IHS Global Insight advised in an analysis. Overall growth has hit a soft patch that economists expect to be temporary — but might end up lasting a lot longer than anybody would like. GDP growth during the past 12 months was just 1.6%, including the latest revision, according to Moody’s Analytics. That’s about the expected pace of growth in the current quarter, and it’s actually a slowdown from the pace in 2010 and 2011. The good news is that growth immediately after the recession ended in 2009 was driven by government spending and other fiscal stimulus measures. Those programs have now faded, with private-sector growth picking up the slack. The big question, however, is whether the private sector is growing enough to fully offset tax hikes and spending cuts that went into effect this year. The weaker numbers suggest it may not be, which could delay any policy changes at the Fed that are predicated on an improving economy. Bernanke has highlighted private-sector gains, including the housing recovery and an uptick in hiring, as reasons for optimism, and hinted that the Fed could begin to taper its “quantitative easing” program — which tends to push interest rates down and stock prices up — by the end of 2013 if those gains continue. Like many economists, the Fed expects growth to pick up in the second half of 2013, as the effects of “fiscal drag” fade. But the lower numbers for the start of the year — especially the signs that consumers are still struggling -- could prompt downgrades in growth estimates for the rest of the year. “This type of news certainly doesn't fit the argument that tapering will occur in the near future,” Patrick O’Hare of Briefing.com wrote in an analysis of the GDP numbers. Financial markets seem to agree, with the interest rate on 10-year Treasury bonds — which has shot up as Bernanke and others at the Fed have been talking about reining in quantitative easing — falling on news of the lower GDP numbers. And stocks rose, which might indicate that traders feel the beginning of the end of QE has been pushed further into the future. In the parallel universe that financial markets inhabit, bad news about the economy is often good news for somebody. In this case, weaker-than-expected economic growth could bring relief for homebuyers who have watched with alarm as mortgage rates have risen by nearly a full percentage point in just two months. That has happened as traders anticipate coming changes in Fed policy that would likely push interest rates up. But if those changes get delayed, interest rates may drift back down for at least a few months. The strange irony of an economy that can’t quite get up to cruising speed is that minor setbacks may help, by prolonging easy-money policies, while improvements may hurt by hastening the end of Fed policies that have been very friendly to financial markets. We could end up talking for a long time about the Fed backing away before it ever actually happens.